Command the ships that made history! For five years, thousands of players have re-created historic naval battles with The Great War at Sea series, twice named the yearâ€™s best historical boardgame. Fleets of 11 nations vie for control of the Mediterranean Sea, with playerâ€™s ages 10 & up taking command of their nationâ€™s destiny at sea. 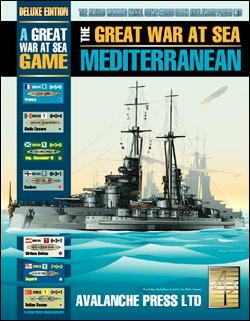 Other products in the "Great War At Sea" series.